I'm watching the last inning of the Phillies game as I write this. They are a super, super team, of that there is no doubt. However, I would have liked to see them at least win two of three against the surging Atlanta Braves. Another division rival tomorrow in Florida against the Marlins. Ah, baseball chatter. Must be Spring...and Spring has certainly sprung for the The Philly Food Feed as we are back in blogging action for the 2011 farmers' market season. With the weather finally changing to bearable, the Food Feed family has been enjoying the kick-off of this year's farmers' market season at two of Philadelphia's premier markets - Clark Park Farmers' Market in West Philadelphia and the Headhouse Farmers' Market in Society Hill. Moving on to West Philadelphia - Saturday marked the "unofficial" kick-off to the season at the Clark Park farmers' market although this market is open all year round. 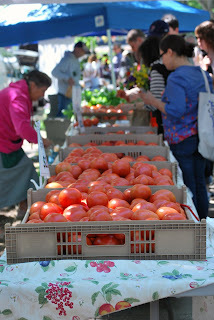 With the Spruce Hill May Fair going on right across the street and the return of Gina Humphreys of Urban Girls Produce, Fahnestock Fruit Farm, and the University City High School garden club to the farmers' market, foot traffic was at a level not seen since last summer. I asked Jon Glyn, Clark Park market manager and Food Trust stalwart about the turnout and his enthusiastic response said it all - "As usual, the Spruce Hill May Fair was a wonderful, family-oriented event, full of great food and interesting music, local businesses and lots of sunshine and good cheer. The turnout was amazing. Everybody was in that spring mood. Everybody was green and flowering inside." I'm flowering inside just reading that. Lots of guys here flowering inside. I must be growing an entire garden in my stomach because after cooking what we bought from the purveyors at the park for Mother's Day, I look like I'm eating for two. Asparagus and Lettuce from Brogue Hydroponics, Onions and Potatoes and Eggs from Margerum's Herbs, Grass fed ground beef from Landisdale Farm...Mother's Day brunch and dinner at our house had a distinctive Clark Park flavor this year. 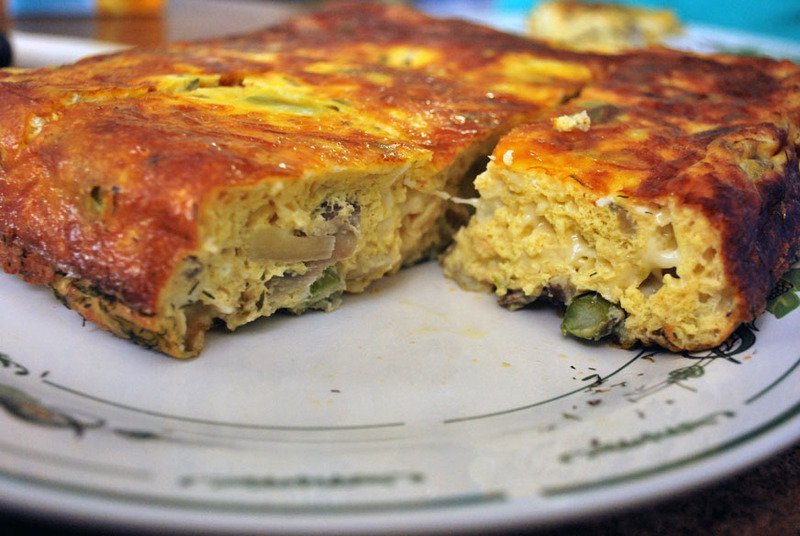 For brunch, I made my lovely wife Sarah an egg bake with said Asparagus, Eggs, and Mushrooms which went over great. I will gladly include the recipe at the end of this post - I found it on the internet and made some adjustments per our personal tastes. It made enough that after brunch I was eating it cold for the rest of the day. As promised, here is the recipe for the egg bake. Special thanks to the Perfect Pantry. Enjoy! Preheat oven to 375°F. Prepare a casserole dish by spraying with cooking spray. In a large bowl, lightly beat the eggs. In a small frying pan, heat the oil, and add the onions and asparagus. Sauté until onions are translucent, 2-3 minutes. Remove the pan from heat and set aside to cool for 2 minutes. Then, mix the onions and asparagus into the eggs along with all of the remaining ingredients. Pour the mixture into the casserole dish. Bake at 375F for 35 minutes, until the casserole is lightly browned and a bit puffy. Remove from the oven and let cool for 5 minutes before eating. I loved the Egg Bake! It came out perfect. This is a nice post and I like your style. And, yes, even though my burger wasn't done enough for me, the whole grilling thing is coming along and I look forward to trying new grilled foods this summer! 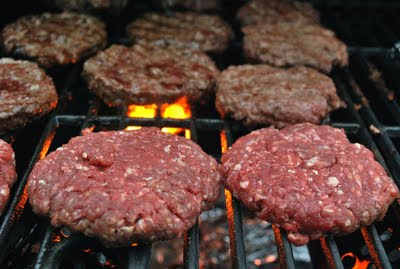 I like the foreshortening in the burger photo, too. Nice capture! Stu did a good job on his interview and Ben Wenk is always a good sport and nice person to chat with. He knows his stuff!